Events in Europe doomed early U.S. gold coinage. The French Revolution of the 1790’s, followed a few years later by Napoleon’s military exploits, drove the world price of gold higher. Unfriendly relations between the United States and Old World powers fueled gold’s rise also. In the U.S., the value of silver to gold was by law fixed at a ratio of 15:1. Elsewhere, the ratio fluctuated according to market conditions. By the early 19th century, an ounce of gold valued at 15 ounces of silver in America was worth about 16 ounces of silver in Paris and London. The precious metal content in U.S. gold coins made them worth more than their face value, if traded in Europe. Bullion profiteers seized upon this opportunity and shipped U.S. gold overseas for melting just as soon as it left the Philadelphia Mint. Profits were most easily realized for the largest U.S. gold coin at the time, the $10 gold eagle. The eagle was created by the Mint Act of 1792, and was deemed to be the flagship of American gold coinage. Ultimately, nearly all eagles coined were lost to opportunists, and to halt this indignity, President Thomas Jefferson ordered production of the eagle stopped in 1804. In 1834, Congress changed the bimetallic ratio to 16:1, thus reducing the amount of gold in U.S. coinage to discourage metals speculators. For the first time, gold became a viable medium of exchange throughout the nation. After an absence of 34 years, the $10 eagle reappeared in 1838. On Jan 1, 1863, President Abraham Lincoln signed into law the Emancipation Proclamation, freeing all slaves in Confederate states and dramatically changing the objectives of the Civil War. 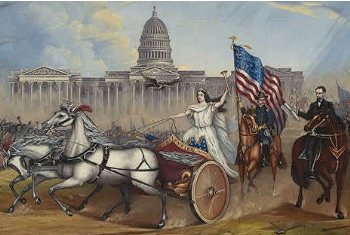 The painting above by A.A. Lamb shows Lady Liberty, the same allegorical figure portrayed on U.S. coinage since its inception in 1793, riding through Washington in celebration. To her right are legions of freed slaves, and to her left are Lincoln with proclamation in hand and the Union army. Christian Gobrecht’s Coronet design, shown above, depicted Miss Liberty looking left, wearing a small crown called a coronet, inscribed with the word LIBERTY. Her hair is tied in a bun with a few curls flowing down over the ear. The reverse features the eagle originally designed by Assistant Engraver John Reich in 1807. 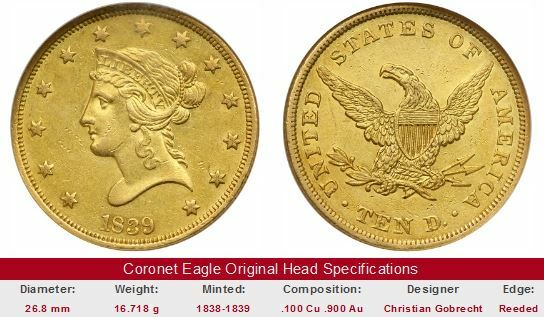 Many collectors refer to the ten dollar Coronet type as the Liberty Head Eagle. During 1839, Gobrecht retooled Liberty and centered her over the date. Coronet Eagles were minted every year until 1907. The only noticeable modification during the 69 production run was the addition of a scroll on the reverse bearing the motto IN GOD WE TRUST. Following the passage of the 1834 law, gold coinage poured into circulation, but of the $2.50 quarter eagle, the $5 half eagle, and the $10 eagle, the eagle was the coin least in demand. Consequently, mintage seldom exceeded a million pieces a year for the Coronet Eagle. Five dates have production of less than 1000 pieces. The rarest of all Coronet Eagles is the 1875, with a mintage of a mere 120 pieces. A collector can expect to pay at least $30,000 for a specimen in F-12 condition. There were 20 Proof coins made in 1875, and these are valued today at more than $200,000 each. One fact that is important to know about Coronet Eagles is that during their years of service, not many of them were preserved in mint condition. Back then, $10 carried a lot of buying power, and few collectors could afford to set a Coronet Eagle aside for posterity. Consequently, Coronet Eagles in MS-60 or higher are exceptionally difficult to find, especially those dated 1880 or older. In addition to the key dates above, collectors should concentrate on these coins too, provided an ample budget and a desire to own gold coins of high numismatic interest. The long term value trends of the 1878-S in MS-60 condition are shown below to illustrate the bona fide popularity of Uncirculated Coronet Eagles amongst collectors. When purchasing key date or Uncirculated Coronet Eagles, the most critical advice we can impart to you is to consider only coins that have been certified by one of the four leading grading service companies: PCGS, NGC, ICG, or ANACS. Some of the lesser known services have reputations for overgrading coins, sometimes only to goad buyers into believing they've found a bargain. There is a huge difference in value between an AU-50 and MS-60 older date Coronet Eagle, so if you're taken in, you'll surely be disappointed later on. Experienced collectors have greater confidence in coins graded by any of the Big Four, and will pay more accordingly. The opposite is true for just about any other grading service. 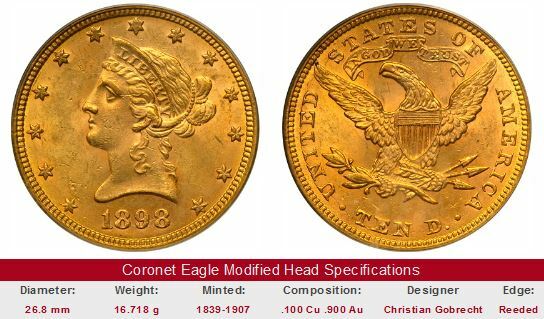 The links below initiate a search of eBay coin auctions for the indicated key date Coronet Eagles. The left hand side of each "Sales Box" reports value trends over a very long period of time for the key date in F-12 condition. The percent annual increase since 1950 is computed for comparative purposes. Then there is the 1878-S, which is used here to typify value trends for MS-60 Uncirculated Coronet Eagles. The "View All" link on the right side of the 1878-S Sales Box is coded to isolate Uncirculated Coronet Eagles of any date, not just the 1878-S. Many times, you'll be viewing coins advertised as Uncirculated, that in fact, are not. One last time: Consider only those coins that have been certified by PCGS, NGC, ICG, or ANACS. Also, the coin pictured for sale in the right hand side, if any, is not necessarily the same condition coin as that represented in the value trend analysis on left hand side.